Usually the highlight of the Golden Globes’ Red Carpet is the fashion. While the fashion was overall fabulous, for me, last night, my Red Carpet moment was the ER reunion between George Clooney and Julianna Margulies. They looked genuinely happy to see each other. George was complimenting Julianna on her outfit and congratulating her on her nomination (Best Actress – The Good Wife), as was Julianna to George (Best Film – Argo – he is a co-producer on the film). Check out George and Juliana back in their ER days as Dr Ross and Carol. This entry was posted in Movie News, TV News and tagged E! 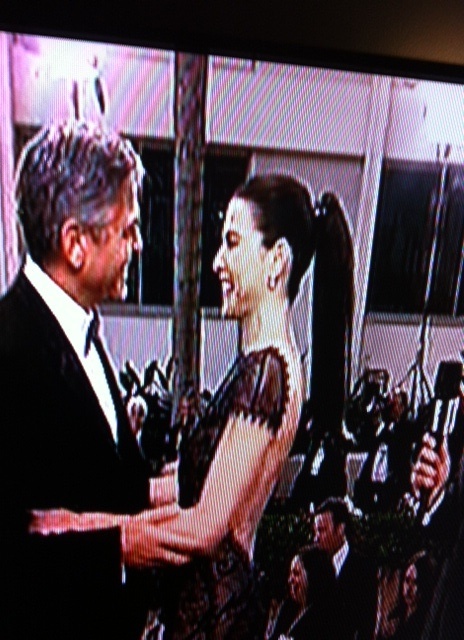 Red Carpet, ER, George Clooney, Golden Globes, Julianna Margulies, Sarina Bellissimo, The Bellissimo Files. Bookmark the permalink.